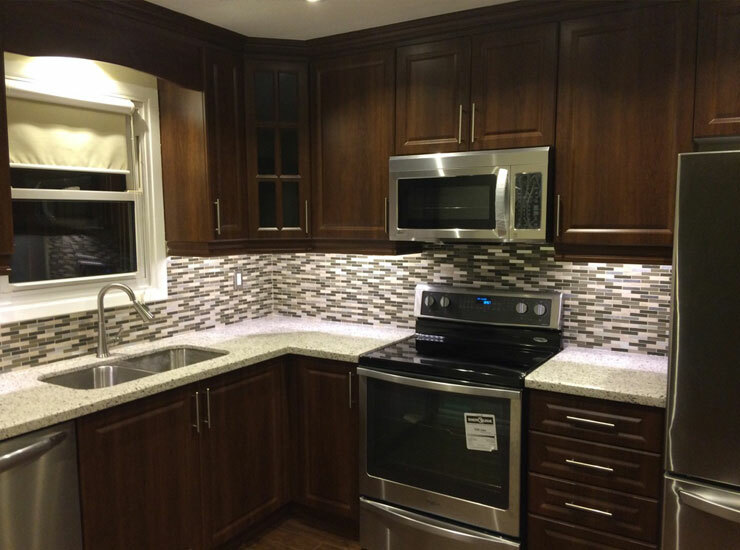 Colony electrical Inc. has many years of expertise in kitchen renovations in the Oakville, Burlington, Mississauga area. Colony Electrical Inc. can help you at different stages of your kitchen renovation, from design to demolition to construction. A kitchen can be integrated with your social area and when it has the proper layout which provides beauty plus functionality while at the same time is complemented with the proper finishing touches like cabinets, sinks and appliances will provide the perfect space for family and social interaction while at the same time increase the value of your home. Colony electrical can help you design your dream kitchen renovation, no matter if you are looking for an open concept, a modern kitchen, or just a refurbishing of your current kitchen. When dreaming of their kitchen renovation, homeowners usually visualize their future kitchen with all their dream appliances and finishes, using the best, and probably the most expensive, materials: marble, food preparation area, backsplash, top-notch appliances, flooring, cabinets and lightening, etc. What needs to be considered for a Kitchen Renovation? Our experts can help homeowners with a reality check. They will work with them to create a list of “Must Haves” and “Wish Haves”. This will prioritize the most important aspects of the dream kitchen while giving flexibility in the budget and design. Talking to an expert before you start a renovation project can help you understand the scope of work and the hurdles that come with it. Call us today at 416-272-8610 to get an expert’s opinion. Location/Layout: What is the optimum location for your new kitchen? How much area does it takes? Are you longing for an open concept? How much natural light do you want? What kind of food preparation area do you want? What kind of storage do you need (wine, fresh products, cabinets). What appliances do you need to accommodate in your new kitchen? Will you entertain friends and family in your new kitchen? The design, location and distribution of your kitchen considering your goals must answer to all the previous questions. Plumbing Infrastructure: What does exist? What needs to be constructed? What is going to be relocated: sink, fridge, dish washer? Humidity/moisture: Are there current leakages or moisture that needs to be taken care of previous to start any construction. Flooring: What would be the appropriate flooring for your kitchen: should be used ceramic, vinyl, wood? Cabinets: Can the current cabinets be refaced, refinished? We can help you save a lot of money without sacrificing the beauty or quality. Lighting/outlets: What should be the optimal and most efficient distribution of lighting and electrical outlets for your new kitchen? Electrical Infrastructure: Will the current wiring and outlet distribution work for your new kitchen? Does it needs some partial rewiring? Demolition: Is there any demolition involved? Unforeseen problems: Sometimes you may find problems only after demolition has been started as they may be hidden by walls, ceiling or floor. Some examples are moisture or leakages, termites, outdated materials which are dangerous (asbestos, aluminum wiring, out of code electrical work). Include a contingency within you budget for those unforeseen events or compromises to make sure your budget doesn’t balloon out of control and you can deal with things as they come. Homeowners who start kitchen renovations without having professional advice put themselves in a position the time and budget may skyrocket beyond their resources and could end up with an unfinished kitchen that is not functional and that becomes a liability to their property value. When you work with Colony Electrical Inc, you put your project in the hands of experienced and licensed experts whose only goals are to get you your dream kitchen on time and budget. "As one of Toronto’s top rated contractors we at Oborne Contracting Inc. expect only the best for our clients. We understand that as a company we are only as good as our employees and trades. Andy from Colony Electrical is one of the best we have used in our 21 years of successful business. Andy’s good nature and ethical disposition are the reasons we keep going back to utilize his services. He is fair in his pricing and completes his work in a timely and neat fashion. He never hesitates and addresses our projects when required. I certainly can’t say enough good things about Andy as a person and Colony Electric as a loyal trade. For this project Andy was hired to complete electrical clean up, rough in and finishes for a 700 sq foot basement. Clients happy, I’m happy.